Horse-bac is a unique microbial fermentation product made specifically for working and performance horses. Helps restore and maintain a healthy intestinal microflora necessary for optimal intestinal health, digestion and overall equine health. 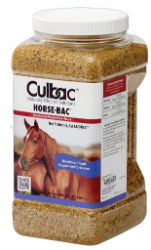 Horse-bac® contains a specific Proprietary Strain of Lactobacillus Fermentation Product cells that effectively maintains the microbial balance in the digestive tract necessary for optimum growth and performance. This healthy balance of the horse’s natural microflora not only protects against invading pathogenic organisms – like E. coli, salmonella and clostridium – but also helps maintain a good intestinal environment, which helps horses to avoid the many serious digestive problems commonly affecting them, such as colic – a condition that can be caused by excessive gas or blockage of the intestines. Dried Nonviable Lactobacillus helveticus Fermentation Product, Dehydrated Alfalfa Meal, Dried Cane Molasses, Mineral Oil, Calcium Carbonate, Vitamin B12 Supplement, Riboflavin Supplement, Choline Chloride, Vitamin A Supplement, Niacin, Zinc Oxide, Manganous Oxide, Ferrous Sulfate, Thiamine, Mononitrate, Vitamin E Supplement, Soybean Oil, Ethoxyguin, Vitamin D3 Supplement.